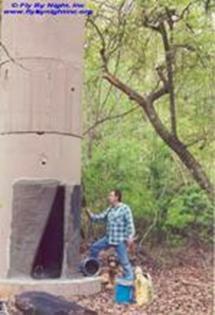 The five bat houses at this site were installed as part of BCI’s Bat House Research project. The guano below the bat houses reveals the preferred house. Tom Finn modifies the opening of an experimental roost designed for Corynorhinus rafinesquii / M. austroriparius in southern Georgia. Joint with Bat Conservation International. 1993 BCI's Student Research Program Grows. BATS. 11(3)16-17. Successful Bat Houses Shed Light On Bat Needs. The Bat House Researcher. 1(1)1-2. 1994 Two Additional Species Documented to Use Bat Houses. The Bat House Researcher. 2(2)1-2. 1995 Patience Pays Off in Florida. The Bat House Researcher. 3(2)2-3. Innovative Roost Partitions. The Bat House Researcher. 3(2)1-2. Guano Treatments Appear to Help. The Bat House Researcher. 3(2) 4. 1996 Research Associate Participation Increases The Bat House Researcher. 4(1)3. 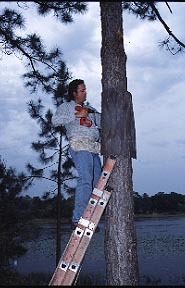 1997 The Use of Bat Houses in the Management of Central Florida Bats. The Bat House Researcher. 5(1)5-6. 1998 Highlights of 1997. The Bat House Researcher. 6(1)4-6. Observations from the Heat Wave of 1998. The Bat House Researcher. 6(2)1-2. 1999 Backyard Bats. BATS. 17(4)3-9. Distinguished Research Associates. The Bat House Researcher. 7(1)8. Results from the 1998 Season. The Bat House Researcher. 7(1)1-2. 2000 1999 Season Results. The Bat House Researcher. 8 (1)1-3. Research Associate Highlights for 1999. The Bat House Researcher. 8(1)7-8. 2001 Distinguished Research Associates. The Bat House Researcher. 9(1)8. 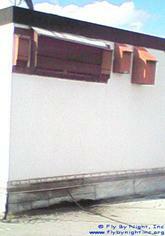 2003 Innovative Homes for Bats that Shun Bat Houses. The Bat House Researcher. 11(1)1-2. Disney's Magic. BATS. 21(2) 1-4. 2004 A Decade of Bat House Discovery. The Bat House Researcher. 12(1)1-5. Bat House Hall of Fame. The Bat House Researcher. 12(1)8. 2006 Designing Homes for Forest Bats. BATS. 24(3) 9-11. Ø Bat House Use in Central Florida, With Emphasis on Tadarida brasiliensis cynocephala And Nycticeius humeralis. MS Thesis, University of Central Florida, Orlando, FL. 194pp.